I was planning on just doing nothing yesterday, because it was my last day off before going back to teaching, but I couldn’t stop. I had to do the trimwork. All along, I intended to copy the trim around the door and windows of the room. 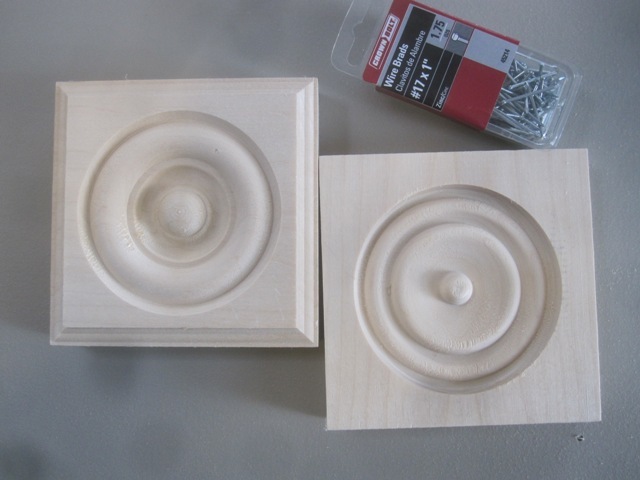 It’s a pretty standard old house trim: grooved borders, and corner blocks with circles. While I couldn’t find an exact match, I did find something that is complementary. One of the stores I went to had everything I needed, so I got it all and went home. But I forgot to get smaller nails, so I had to go back out. I was mad. I went to another store because it was closer. While I was there, I went to look at their trim and saw that they had nicer corner blocks. What was originally an angry trip turned into a blessing. I once wondered if I should thank God for such small, silly things. I don’t wonder any more (James 1:17). I even found some nice molding for the corners. I think the cabinet looks so much better with the trim. It looks like it belongs in the room. Here’s a full picture of the cabinet. You can see the similar trim around the door to the room in this picture. 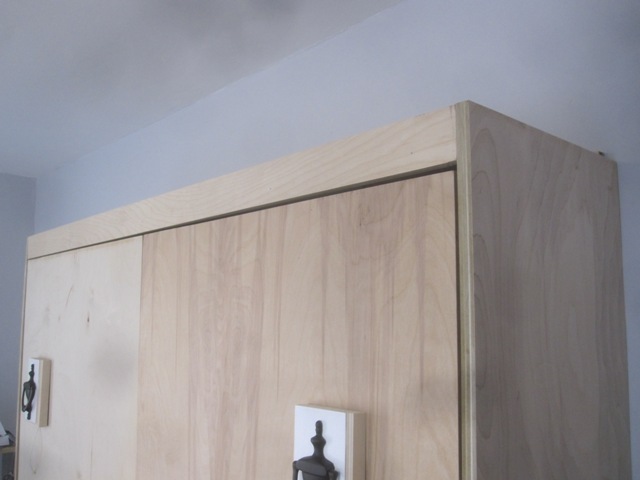 You can skip ahead to the next Murphy bed post by clicking HERE. Holy Catfish! That truly completes it. So it opens over that bottom trim board, right (trim board staying on the ground)? Very clever. 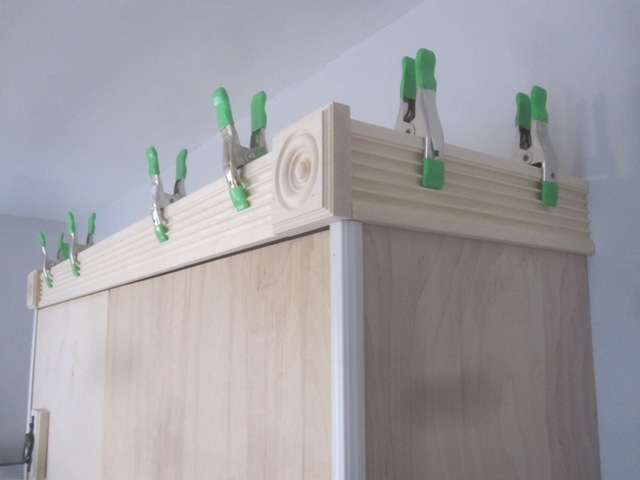 The trim work is excellent – well chosen!! It looks great!! Do you have an incredible sense of satisfaction? 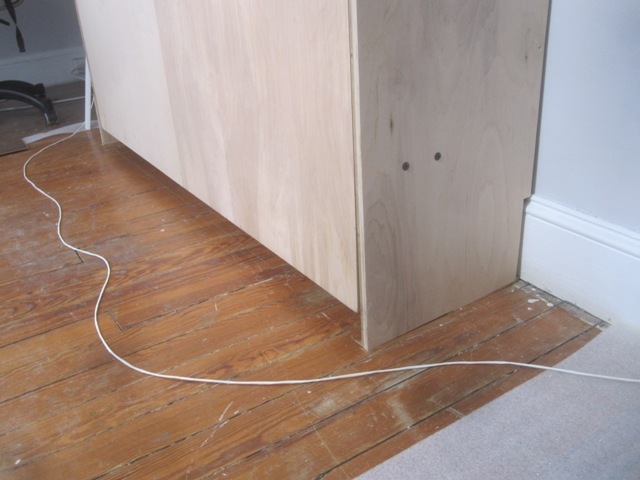 Yes, the bed does open over the stationary baseboard. 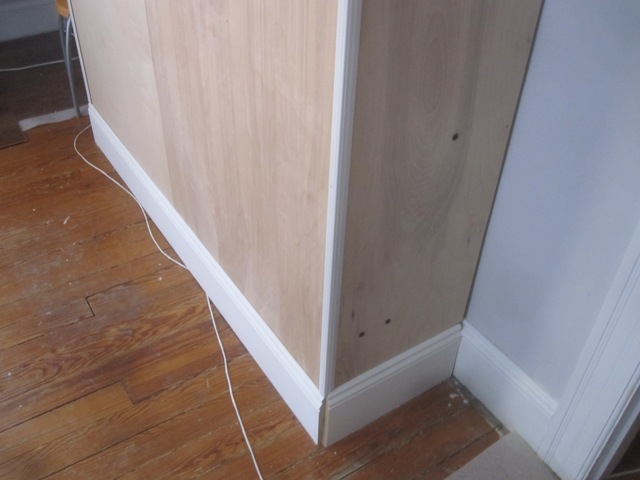 I had to rip-cut a half inch off the baseboard because the fold out legs are seven inches tall and the baseboard was seven and a half. I do feel quite good about this project. This morning I really want to get the handles and paint the cabinet, but I’m at school. I hope I’m not so tired from school that I stop working on this altogether. But it might be the weekend before I work on it again. It’s just a wooden box… Hehe…. Wait. Just a wooden box? A wooden box that contains something hot & cold? I forgot to say how truly wonderful it looks!! It’s just so cool!! The finishing touches will be a snap after all this intricate work. Looks great, Brad. Thanks so much for doing this. I feel like I can take it on now! I remember you saying a few days ago that this was a kit. I see that you have needed to go to the store to get many supplies. What came in the kit? The kit included the metal hardware that makes the opening and closing work: pneumatic springs, latches, and hinges. It also had the detailed plans. I had to buy the wood and screws. And lots and lots of drill bits. 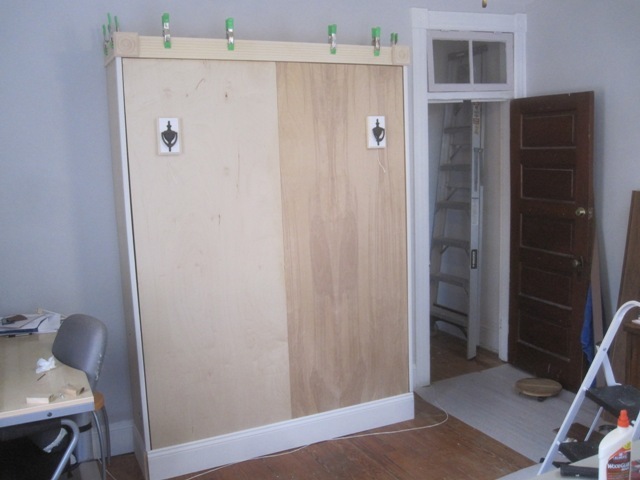 Hi Brad, Just wanted to let you know your blog gave me the courage to start my own Murphy bed. Just finished it last weekend and it turned out beautiful! Thanks so much for posting all the information on it. Would not have done it without your step by step instructions. I even ended up with the paint stick under one of the door cutouts. Too funny! Thanks!! That’s awesome, Joyce! I still haven’t gotten around to painting mine yet. School stuff got in the way. Now that it’s summer, I should have more time (I’m a teacher). What finishing touches did you decide to put on yours? Did you stain or paint it? I stained it and gave it a mission look. Don’t know how to post a photo to this. I would if I could. Hooray for Joyce!! She should e-mail a photo so we can all see it. I 2nd that! I’d love to see it!